One of Trinity Central’s core values is that we are a family on Jesus’ mission together. So you know that when we tell you we’re excited about our youth stepping into serving opportunities, we really, really, (REALLY) mean it! Belkin House is a homeless shelter in the heart of Vancouver. 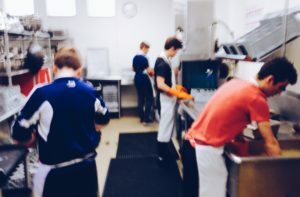 The facility can house up to 24 men, women and children, and can feed even more than that, with the help of 114 full and part time employees as well as volunteers. Their mission statement is to “share the love of Jesus Christ, meet human needs and be a transforming influence within our community”. This is where WE come in! 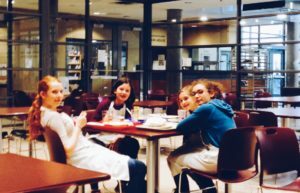 Our youth have been serving here a couple of times each year, making meals and serving them to the Vancouver’s most vulnerable. What an honour and privilege for the youth to be Jesus’ hands and feet in this way. It’s immensely inspiring to speak to them and hear about their experiences, so don’t forget to ask them about it! I loved making food and then seeing others eating it! I enjoyed the opportunity to serve our community in Vancouver. There are so many needs to be met and I am grateful to be a part of the solution to bring hope into people’s lives in a practical way. The staff were amazing and very welcoming, as were the people we served. I look forward to doing it again soon! (I) liked serving the food and helping those that came along. 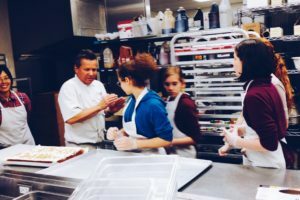 I felt all the youth worked very cooperatively with each other in their assigned kitchen and serving duties and the chef was impressed with and appreciative of them. … During dinner, I sat with a resident, chatted with her and got to pray for her back pain. She returned to find me afterward to report her back felt better. She then invited two other residents to join the Sunday service! For more information about Belkin House, you can visit their website.